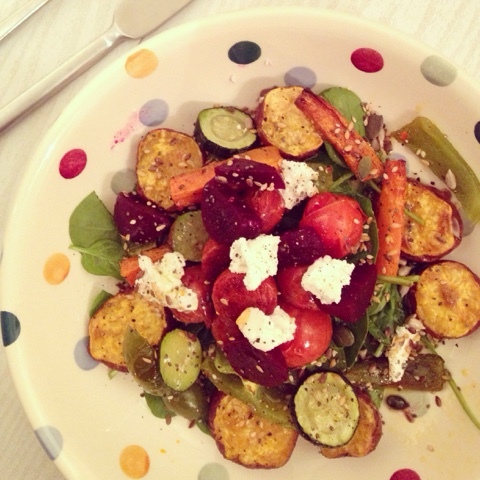 "Ooooh I think I fancy a salad on this freezing cold, autumn evening" - Said no one ever. Well mine have taken an autumnal turn and I think you're going to like it. Whoever said that salads are boring obviously hasn't seen my Instagram. I class salad making to be my most prominent skill in life. Give me a fancy pants dish and some greens and I can make you love it in no time, but with summer long gone, no one feels like iceberg lettuce on a bed iceberg lettuce for dinner. We don't need our beach bod's for another 8 months, so let's not torture ourselves any longer. In summer I enjoy my salads raw. Lots of grated carrot, chopped tomatoes and peppers. As soon as it turns that little bit chilly they go straight in the oven. 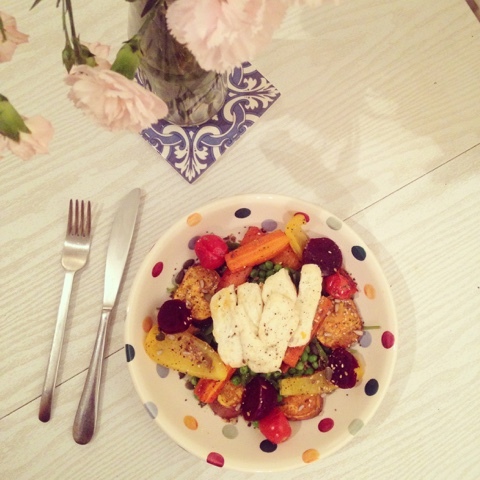 Roast veg is a dream on salads with a big dollop of houmous. Roast carrots, sweet potato, peppers & tomatoes with added spinach, peas, beetroot, halloumi, seeds & a glug of olive oil. Roast carrots, sweet potato, peppers, courgette & tomatoes with added spinach, beetroot, chorizo, goats cheese, seeds & a glug of olive oil. 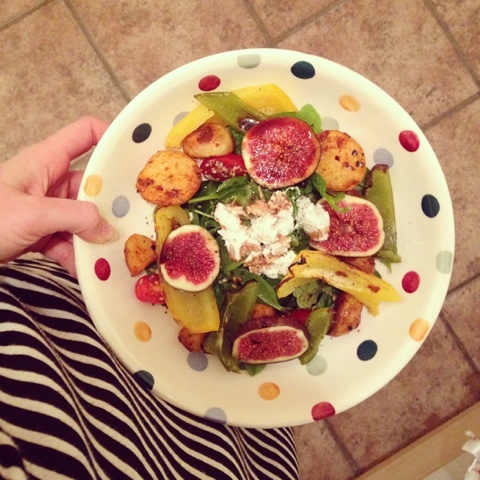 Roasted peppers, new potatos & tomatoes with added spinach, figs, goats cheese, seeds, balsamic vinegar & a glug of olive oil. 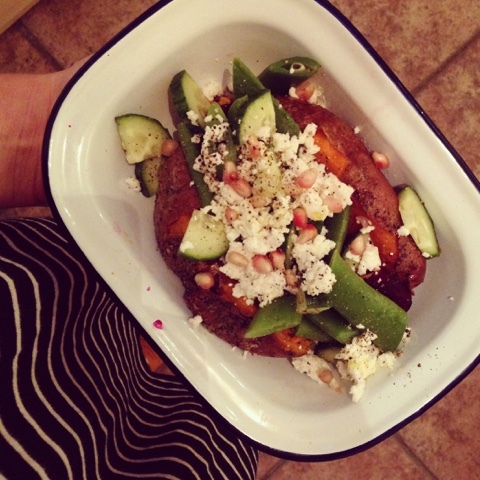 Roast sweet potato filled with some salted butter, runner beans, cucumber, beetroot, goats cheese and pomegranate seeds. Making these dishes are soo easy. It usually takes around 45min to an hour to roast my veg, so I throw it in the oven, crack on with important chores (sitting on instagram with a cup of tea) and let it cook into something delicious. 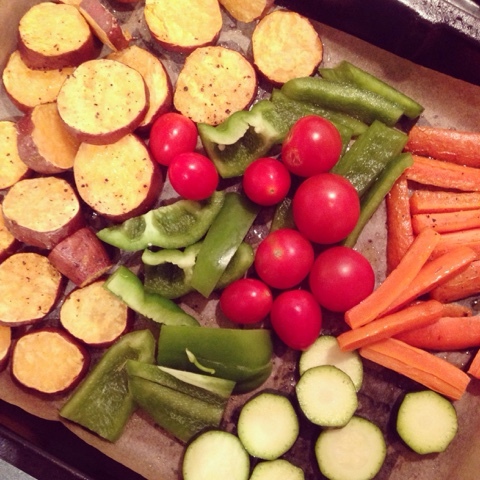 I put my sweet potato and carrots in with some salt and pepper and olive oil and after about 25 mins add my peppers, tomatoes and courgette. When the veg is almost done, fry any toppings like halloumi or chorizo, put some spinach in a bowl and voila, it's all ready to be inhaled. Autumn, I like you, you can stay.